Potlucks are all the rage among the twenty-something crowd, and for good reason: they’re budget-friendly, they save pre-party space, and they’re a fun and creative way to involve guests. If the thought of hosting a party or dinner overwhelms you, but you are dying to get a group of friends together, look no further than the potluck. Why not create your own tradition with family or old college buddies? Fancy something bite-sized? Mix it up with a themed fondue party. Should you find yourself invited to one of these types of gatherings, it is always a good idea to keep a few simple, quick recipes on hand to ensure success no matter where you go. And: always have some champagne around! Here’s how champagne fits into the mix. How it works. 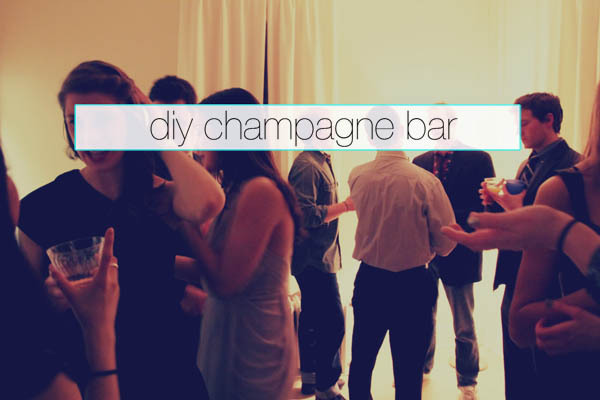 A DIY Champagne Bar takes the potluck spirit and infuses it into a classy, celebratory event that, like a fondue party, allows guests to get creative with materials and produce unique, individual concoctions. Have guests bring the basic ingredient – champagne – while you provide the rest. Offer directions, pretty glasses, and mix-ins so that guests can make their own champagne cocktails. This party does away with the burden of pricey hosting but offers party-goers the chance to increase their bottle’s potential sixfold. Everyone will enjoy experimenting with flavors and creating several different cocktails from one bottle of bubbly. Plus, compared to other types of booze, BYO “champagne” is relatively inexpensive – $5 bottles are welcome! Prepare your ingredients. The recipes listed below are fairly simple, and the syrups you can do a few days before or that afternoon. For the lavender syrup you will need dried lavender, found in co-ops or specialty grocery stores. Make basic simple syrup. Here’s what to do. Bring all the ingredients to a boil in a small saucepan and reduce to a simmer over medium heat, stirring occasionally, for 8 minutes. Sugar should be dissolved and the mixture will be slightly syrupy. For the lavender and ginger syrups, make sure to strain out any pieces before pouring into a serving container. Little touches are important. Serve all of your mix-ins in accessible, easy to serve containers. Pomegranate seeds, lemon peels, and sugar cubes look perfect in bowls with little spoons. For the syrups, try standard salad dressing dispensers or coffee creamer containers that pour easily. Most stores have plastic champagne flutes that can be spiced up by tying a colorful ribbon around the stem. Make sure to have napkins on hand, and maybe even some cocktail snacks: nuts, bruschetta, chocolate – there are endless possibilities. The set-up. You will need a table with one designated “start” area (this can be a long or circular table) where the glasses will be set-up. From there, line up your ingredients by drink, creating a buffet of sorts. Directions are important, so I encourage you to design little recipe placards on sturdy paper or laminated paper. Space out the placards and ingredients so there is enough room at each station. Place sugar cube in bottom of flute. Soak with a few splashes of bitters. Fill flute to the top with champagne. Pour champagne into flute until almost full. Add two splashes of vanilla syrup. Garnish with a spoonful of pomegranate seeds. Combine one part orange or grapefruit juice with two parts champagne. Pour champagne into flute until almost full. Add two splashes of lavender syrup. Garnish with a lemon twist. Pour two splashes of ginger syrup in flute. Add a splash of lemon juice. Fill flute to the top with champagne. Garnish with lemon twist. Kenzie Zimmer’s favorite champagne cocktail is the Black Velvet, a combination of Guinness and champagne. She is looking forward to spring break, when she can start one new addiction (Downton Abbey) and continue another (Game of Thrones).